THE MOST comprehensive presentation to date of the work of Gareth Kennedy, the award winning Irish artist, who co-represented Ireland at the 53rd Venice Biennale in 2009, opens this week in Galway. Invented Tradition, an exhibitoin of three select bodies of work from the last two years of Kennedy’s practice opens tomorrow in the Galway Arts Centre, Dominick Street, and runs until February 7. The first floor at GAC will host Post Colony (2014 ), a 16mm film about woodwright Eoin Donnelly, who established a green woodworking and charcoal burners encampment at the site of the isolated ruin of the Victorian Glena Cottage in Killarney National Park. The film narration presents a speculative history of the park from the Plantation of Munster in the late 1500s to its current status as a tourist destination and special area of conservation. The GAC ground floor will host the Irish debut of Kennedy’s The Last Wooden House of Kupchino (2013 ), produced in the Kupchino district of Saint Petersburg, Russia. The project takes the story of the so-called ‘last wooden house’ of Kupchino as a starting point. What was once a small village of c38 wooden houses would later become a sprawling district of uniform apartments which were developed in the USSR during the 1960s under Nikita Khrushchev. The last wooden house in Kupchino was demolished in March 1976. 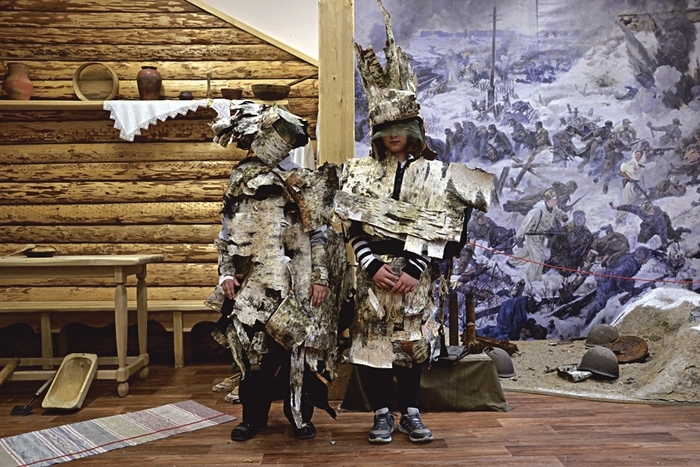 Kennedy worked with young people in Kupchino schools, which led to a timber model, based on plans of the Last Wooden House, being paraded through Kupchino, where a musician and schoolchildren dressed in birch bark costumes join the procession. Kennedy will take part in a panel discussion as part of the launch of the PLASTIK Festival of Artist’s Moving Images and Experimental Film. The festival is taking place in February in Cork, Dublin, and Galway with the official launch tomorrow in An Taibhdhearc Theatre, Middle Street, at 6pm. The panel discussion will focus on the production, exhibition, distribution, and preservation of artists work on film in Galway and how it can be supported. Also discussed will be education, venues, upcoming initiatives, and production facilities, as well as Galway’s new status as a UNESCO City of Film. Kennedy will be joined by Rod Stoneman (Huston School of Film & Digital Media, NUIG ), Maeve Mulrennan (Galway Arts Centre ), Declan Gibbons (Galway Film Centre ), Celine Curtin (GMIT Centre for Creative Arts ), Tracy Geraghty (Solas Picture Palace ), and Louise Manifold (Wildscreen ).